Analysis: Despite today’s phone call, the ‘elephant in the room’ continues to loom large. ON 10 MARCH, Enda Kenny secured 57 Dáil votes in his failed bid to be re-elected Taoiseach. On the same day, Micheál Martin secured 43 votes as he failed to succeed Kenny. In the three weeks since then, Kenny has lost Labour’s seven votes (although he may yet win them back) and quietly – without needing to ask – gained independent TD Michael Lowry’s support (he wasn’t there on 10 March). Meanwhile, Martin is still on 43 votes. In that period, both parties have courted the support of the Social Democrats, the Green Party and over a dozen independent TDs without either, so far, securing any extra votes. The Greens and the SocDems have since withdrawn from talks, while the independents remain in the room, handily gaining daily publicity from their engagements with both parties. The talks have been lengthy, slow-moving but (Fine Gael argues) productive and have led to various public comments from all sides about how they will continue to engage. 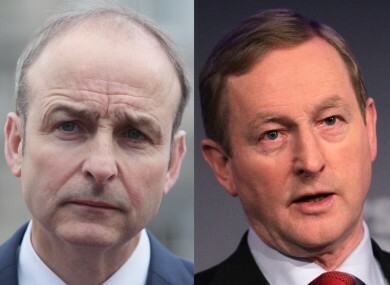 But still the stark reality facing both Fine Gael and Fianna Fáil is that, as it stands, neither of their leaders will elected Taoiseach next Wednesday, 6 April. The next battle will be to see if either can at least secure more votes than the other. “We’re trying to win on Wednesday. We want more votes than Enda Kenny on Wednesday. If we do that, we are then in a position to form a minority government,” said a senior Fianna Fáil source today. The prospect of a Fianna Fáil minority government seemed to be off the table last week, but the party has attempted to restart the process by setting up a series of roundtable meetings with independents next Monday and Tuesday. In addition, Micheál Martin sought to take the initiative by making contact with the Taoiseach today and the pair had a cordial telephone conversation. That was followed by an almighty and unedifying dispute about what was actually said. No one on either side can agree on whether they agreed to meet next Wednesday, didn’t agree that or that Kenny offered to meet tomorrow, which Martin doesn’t want to do in advance of his party’s talks with independents next week. There now does seem to be a consensus that they will meet to talk next week. But if they can’t even agree on the contents of a conversation between their two leaders, what hope is there that the parties can agree to govern with each other, or to at least support the other in governing? In his call with Kenny earlier, Martin said he took issue with Richard Bruton’s remarks on Morning Ireland yesterday when he said Fine Gael would not support a Fianna Fáil-led minority government. But Fine Gael is not rowing back from this stance. As far as it’s concerned, Fianna Fáil just doesn’t have the numbers to be in a position to govern. “It won’t happen, the numbers don’t work, we all know that, even he knows that,” said one senior Fine Gael source of Martin earlier. But does Fine Gael have the numbers? It initially and ambitiously set a target of winning 71 votes when the Dáil tries to elect a Taoiseach next week. That is now mathematically impossible with the withdrawal of the Greens and it seems unlikely that all of the 15 independents the party continues to court will end up backing Fine Gael. Waterford TD John Halligan is publicly wavering while others are privately frustrated at the torturous pace of the talks and believe, like most others, that Fine Gael needs to start talking with Fianna Fáil now. There’s also another problem: Enda Kenny. Some independents, like Tipperary TD Mattie McGrath, cannot countenance voting for him to be reelected as Taoiseach, describing him yesterday as “the elephant in the room”. But the real elephant in the room is that Fine Gael and Fianna Fáil need to start talking to each other. That process began tentatively today, but if the disputed phone call is anything to go by, discussions on the formation of a government will be fraught and drawn-out. Even Micheál Martin was acknowledging today that while people are “anxious to know when a government is formed” it is still “some few weeks away from that yet”. There could yet be another 33 days of this. Email “After 33 days, is there any sign of a new government?”. Feedback on “After 33 days, is there any sign of a new government?”.